Repeat the same for regular square through Row 2. Cut yarn after Row 2 and join with a different color for Row 3. Cut. Leave a long end to whipstich to next square. (I go from one corner ch2 sp to the other) The original version has 9 squares whipstitched in a row. You can do as many squares as you want. This will determine your blanket's width. Once you have your row whipstitched together, put a border on that row. BORDER: Use a "Main Color"
Starting in the "upper right" corner of your row, join with a sl st in a ch2 space. ( Sc, ch2, sc in corner ch2 space, sc in each sc, hdc dec in the ch2 spaces between squares) repeat this around the row, finish with a slip stitch to the first sc. Finish off, leaving a very long end of yarn to whipstitch your rows together. Create as many rows as you want. My blanket had 10 rows. This will determine the length of your blanket. 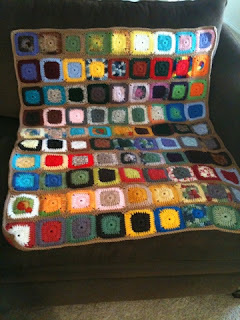 When you have all the rows you want, repeat the border around the outside of the whole blanket.